Whilst in Sham Shui Po, we went in search of a stall which featured in our guidebook. The stall seemed to be famous for little sweets or cakes which looked delicious in the photograph. We found the stall and bought 2 of these "cakes" from the friendly lady. We got a red bean pudding and a black sesame cake. 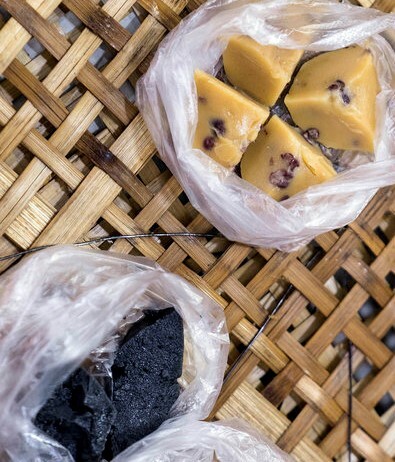 We expected something really sugary and sweet, but got a real surprise when biting in to them - the red bean pudding was a kind of rubbery thing which tasted slightly of mashed up kidney beans, and the black sesame cake, tasted of sesame seeds and soil... mostly soil. It's probably just us though - the stall was recommended by Michelin, so I guess we're not sophisticated enough to appreciate it.